During the 1840s and 1850s, anti-immigrant feelings grew among many native-born whites. Nativists argued that immigrants caused many of the nation’s ills by rejecting “American” work habits, culture, and religion. 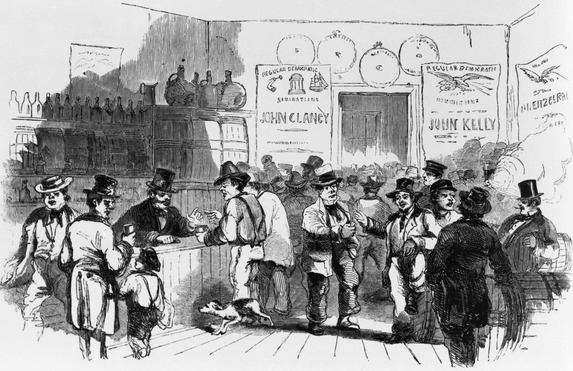 Nativists and and their reformer allies often voiced objection to the undisciplined and sometimes violent atmosphere of working-class saloons, like the one depicted in this 1858 engraving of a Five Points neighborhood bar. As the title indicates, nativists and reformers also objected to the political activity that took place in saloons, and the growing political power of immigrant voters. Source | "The Voting-Place," engraving, Harpers Weekly, 13 November 1858. Cite This document | Unknown, “"The Voting-Place",” HERB: Resources for Teachers, accessed April 23, 2019, https://herb.ashp.cuny.edu/items/show/1626.